Hello and welcome to my blog! This post continues a series in a which I’m building a low table and chair, of Honduran mahogany, to be installed in a tea house. In the previous post the chair spindles were roughed out and placed into their respective locations. This post continues along with that work by capping the spindles off with a back rest, referred to as a comb, and completing the arm rest design which will utilize the posts for support. The comb, in traditional windsor chair building, would be steam bent into shape. However, traditional construction relies upon green or air dried lumber, of which I have neither. It also does not utilize Honduran mahogany, which to my understanding does not steam bend with much success. I’ve chosen instead to form a bent lamination, a bent lamination refers to work in which thin strips of material, with grain running in the same direction, are glued into the shape of a form. Bent laminations, with grain running in the same direction for each ply, differ from molded plywood. Molded plywood changes the grain direction on each ply, and typically, it’s made with much thinner material. As an example; The Wishbone chair, by Hans Wegner, utilizes a bent lamination to create a unique shape in the back support, which supports a steam bent back rest. By comparison the Eames lounge, by Ray and Charles Eames, is constructed of molded plywood. The form, in my case, is something I’ve cut from basswood to mock up a prototype backrest for the prototype chair. That form was then used to support the bending of a white ash wood prototype to create the initial comb. The initial comb was an absolute failure. The mistake I made was in utilizing material that was a bit too thick (1/4″), I also used plastic resin glue and was unimpressed by it. I revisited my approach using 1/8″ material and titebond III glue, the results were successful. With one comb created successfully it was time to move onto the mahogany lamination. I started with 1/8″ material, sequentially cut. I applied glue to each piece, front and back, covering their glue surfaces entirely and using a glue roller to do the job quickly. The important part of a bent lamination is to get the material into it’s form correctly placed rather quickly as the glue begins to set in about ten minutes. Ten minutes seems like a long time, until you’re gluing something…then it doesn’t. Being a glue-minimum shop I don’t keep many clamps on hand, I really don’t need them for the most part. Since I ran out of clamps and yet still needed pressure applied to a few spots (mainly at the edges) I ended up tying slip knots between each pair of clamps. Slip knots allow one to apply a lot of force and so they worked perfectly for this application. The form was released after it cured, and the result did not spring back much, which was a relief. I utilized a compass plane, know as a sori-ganna, on the inside of the form to smooth the curve. I wanted to create a consistent curve and so utilizing the compass plane allowed for that curve to be smoothed in a consistent fashion, the curve ultimately mimicking the curve of the plane sole. The resulting surface, while finely finished, makes an area of thick and thin spots on the face of the outer layer. This is problematic as it risks becoming damaged in use, so I applied an additional layer to create the inside face and offer full thickness of material. The material was planed before lamination. Once the form was again cured it was time to finish the shape. First the back was smoothed with a flat plane. Then the bottom edge trued. The form was laid out, then bandsawed into shape. The outed edge was then shaped with a curved sole finger plane, known as uchimori-ganna, to create a rounded outer edge. The resulting edge is free of sharp corners. Putting the completed comb aside for a moment, I began work on the arm rests. The arm rests would anchor themselves on the posts, and later additional supports would be created. I wanted to complete the arm rests before installing the comb so that the resulting image would be more or less complete. I had convinced myself that the third shape would be a success and so I made it in mahogany, only to find dissatisfaction in the result once completed. I was, however, happy with the basic form feeling only that it needed to be extended. The shape was drawn first on cardboard, then transferred to mahogany for the final shape to be cut from. The shape was roughed out on the bandsaw. It needed to be re-sawn to thickness, then cut to fit the form. Once that was created, I planed the top surface smooth and drew refined lines. The post hole was bored and tapered much in the same way as the one for the seat. The shape was further refined with hand saws, the angles that needed to be cut are much easier to simply cut by hand than attempt to bandsaw. The finished shape was cut with planes. The result will be further smoothed to create an even surface on the end grain. The top surface was then planed into a crowned shape to eliminate the feel of sharp corners on one’s arms. Now returning to the comb, I bored the post holes and refined the posts to fit, somewhat tightly. I then marked my center line, from my center line evenly spaced marks were placed about the bottom of the comb. The comb was then put back in place and the spindles moved into their rough position to mark their respective angles. Those angles were then used as guide to bore 5/16″ holes for the spindles. Each spindle was then cut to length and further refined using the uchimori finger plane, to finalize the shape and also fit the spindle to the hole. The fit aimed for is a semi-tight fit, since they rely mainly on a bending force to remain in position. The comb was assembled and the resulting chair back now complete less some final details before final assembly. 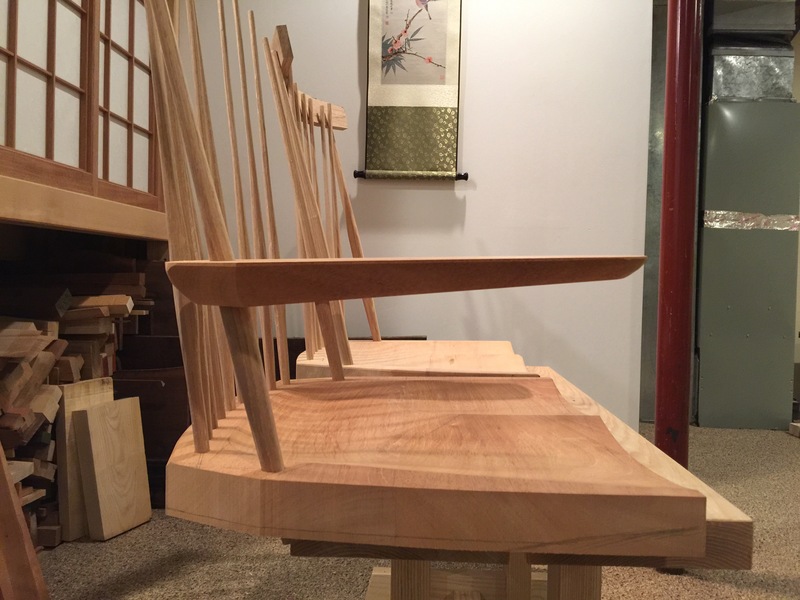 The chair shape is beginning to be realized, and still much refinement must take place before it is completed. Most of that is in the chair seat, which looks rather heavy at this stage, but will appear much less so as it approaches completion. The sides are due to be angled in, the front edge cut into a curved shape and angled downward, then the front underside cut to create a thinner leading edge. The spindles, now in position, are forced into an arch. The arch applies some springiness to the back and makes for a more appealing shape. Thank you for stopping by, and I hope that you have enjoyed this post. Regular readers may notice I’ve made some changes to the blog, I’m interested to see if my readers are enjoying the modified format. The finished form is not quite completed, some work is left to do on the menu, but it’s nearly complete save also for my logo which I’m working on. Great work Brian. I love the way you work, minimal machines and glue etc. Honduran mahogany must be lovely to work. I haven’t heard of anyone being fortunate enough to work it in years. Thanks for your comments! Much appreciated. Honduran mahogany is wonderful to work with, it likely helps that the wood is very old and so doesn’t move much except after big resawing jobs. Planing it creates beautifully clear surfaces with little effort needed to prevent tear out. Laminating is one of those things that I have never gotten around to. I have a project that I would like to do some day that would require it. You manage to make it look easy. Howdy Jonas, good to hear from you! Thank you! I found the process fairly straightforward though I had debated possibly using a two piece form, which may make for more even pressure without so many clamps. How is the arm of the chair indexed on spindle? I presume that in use they will see a lot of lateral force and want to rotate. Thanks Brandon! The arms are due supports still. They would possibly break in use if left unsupported. The supports will also index the arms. Coming along nicely Brian. Already looking like it will sit comfortably. I agree with your decision to extend the armrests. Looking forward to seeing how you finish detailing them. Brian, the chair is really looking good. The form you have designed is quite nice. I too have been struggling as to how to handle the bent crest rails. I like your lamination solution. Great work so far. Thanks Greg! The laminations have worked out nicely. I had many concerns going into it, but all of them have sort of panned out. The trickiest parts I’ve come across so far are setting the angles of everything. Angle of the back, angle of the seat in a lounge position, ect. So I’ve been measuring all of the chairs around the house…anyone looking in on me would think I’ve gone a bit crazy.